Sensory Perceptual issues in Autism and Asperger Syndrome: Different Sensory Experiences, Different Perceptual Worlds by Olga Bogdashina. 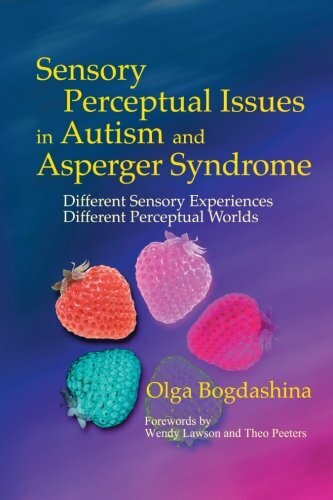 In this book, Olga Bogdashina attempts to define the role of sensory perceptual problems in autism identified by autistic individuals themselves. This book singles out possible patterns of sensory experiences in autism and the cognitive differences caused by them. The final chapters are devoted to assessment and intervention issues with practical recommendations for selecting appropriate methods and techniques to eliminate the problems and enhance the strengths. In addition, parents of autistic individuals and autistic individual themselves will find the information will enable them to initiate relevant strategies and environmental changes to facilitate more effective learning. Pp.192. This entry was posted in Other/Miscellaneous, Our Library and tagged Autism Spectrum Disorder, books, interventions. Bookmark the permalink.